Welcome to MyBinding video. 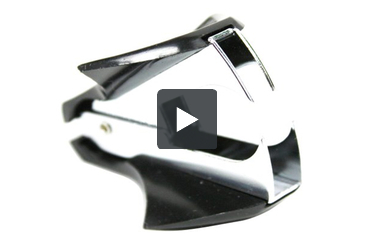 This is a look at the Deluxe Staple Remover by Swingline. Remember back in grade school when you thought this was an alligator? Well, it hasn’t changed much. Improvements are extra-wide finger grips with textured, non-slip surface for precise staple removal and comfort. You can remove staples on the go or flat on the table. That’s it, that’s the Deluxe Staple Remover by Swingline. For more demos, reviews, and how-tos, check out MyBinding.com. the typical method is to remove with the flat part (crown) of the staple being up. However, if you are very concerned with not damaging the paper, you can open up the bent ends of the staple first and then remove it from the flat side.